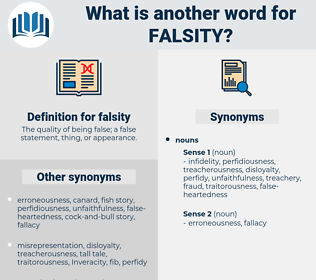 What is another word for falsity? The quality of being false; a false statement, thing, or appearance. faithfulness, forthrightness, truth, loyalty, truthfulness, honesty, constancy, reality, certainty, right, fidelity. 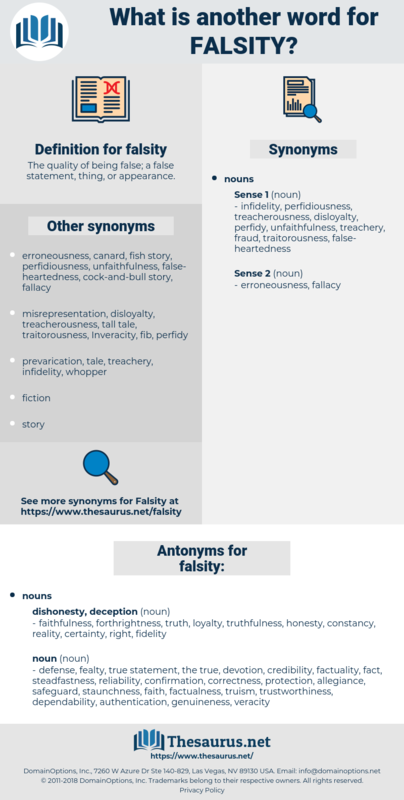 defense, fealty, true statement, the true, devotion, credibility, factuality, fact, steadfastness, reliability, confirmation, correctness, protection, allegiance, safeguard, staunchness, faith, factualness, truism, trustworthiness, dependability, authentication, genuineness, veracity, validation, actuality, accuracy, trueness, devotedness, verification, verity, substantiation, shield. Peace is bliss of heart and soul arising from the conjunction of the Lord with heaven and the church, as well as from conjunction of good and truth, when all conflict and combat of evil and falsity with good and truth has ceased. She could only confirm your ruin, strive with you as she might; you would fall again into hateful falsity. Felis Wiedi, fleshed out, foliaged, flyweight, flag day, felicitate, flaxseed, flake out, fly sheet, flighty, falsehood, falsetto, flighted, false oat, fluctuate, flushed, flesh out, flecked, follow suit, foul shot, flaccid, false teeth, flight, Filicide, fulgid, falcate, fabulist, folic acid, flaccidity, flow sheet, felicity, flyswat, flush it.